Program for type A is installed by default in CM-530. You can find task codes and motion files for other actions on the "Default Program" page. Turn the power switch on and the LED will start blinking. ⇒ If the LED does not turn on, check the power cable/connection. Is the battery fuse intact? ⇒ Please refer HERE for information on how to replace the fuse. I want to check how much battery I have left. Turn the CM-530 on and press the U button. The LED will turn on to show how much battery you have left as seen in the figure below. The robot makes a continuous warning sound while moving. If you do not replace the battery right away, the robot may turn off without warning and fall, which can cause severe damage. 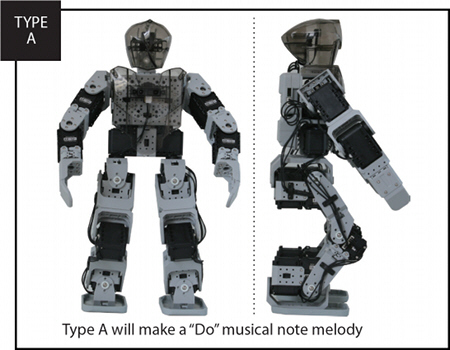 The robot should stand in the basic stance and play a melody according to its type as in the picture below. 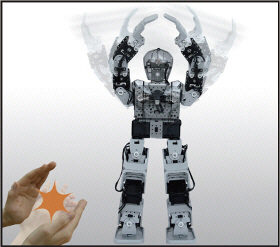 Make sure to hold the robot in its basic posture for 1 minute. 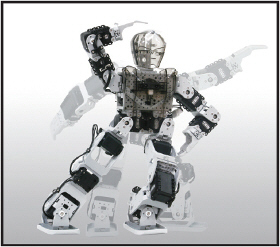 ⇒ This is to allow the robot to automatically configure its gyro sensors so that it can walk properly. ▶ Check the angles of the arms and legs. If they are different from the picture, go back to "Check Assembly Mode"
▶ Check whether the cables have been assembled on the outer part of the leg. If the robot has been incorrectly assembled to an extent where it may be severely damaged, a warning sound will be activated. Also, the LED of the motor with the problem will turn on and release its torque to prevent damage. 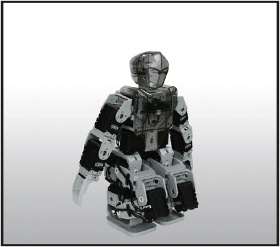 The robot's basic posture and movements are awkward. ⇒ Go back to "Check Assembly Mode" and re-check whether all the dynamixels have been properly assembled. Unable to detect obstacles while in Free Walk Mode? ⇒ Check whether the absolute distance measurement sensor's cables are properly in place. The robot falls down easily while walking or is otherwise unstable. ⇒ Please refer to the Assembly Manual to check whether the gyro sensor has been properly assembled. The torque is released and the dynamixel's LED turns on after a warning sound. If the motor and frames have not been properly assembled or if the robot's joints can not move properly, a warning sound will be activated to prevent damage. ⇒ Find the motor indicated by the LED and refer to the Assembly Manual to check whether it has been assembled correctly. Make sure that the joints are free of cables or other debris. Please refer to "Check Assembly Mode"
The robot type and melody do not match. Check cables for ID 9~10. Check cables for ID 7~8. Some of the cables have not been connected properly. Please refer to the Assembly Manual and check again. ID 9 and10 connected where ID 7 and 8 should be connected. ID 7 and 8 connected where ID 9 and 10 should be connected. R / D / L / U The below buttons stand for the following code. 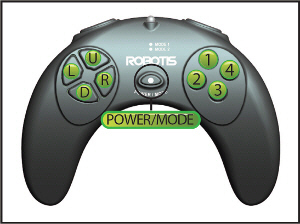 ※ If you press a button on RC-100 before choosing a mode, the robot will enter remote control mode. 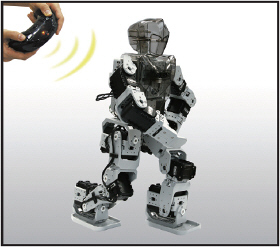 The RC-100 is used to control the robot. Press the POWER/MODE button for 2 seconds. Press the buttons below to control the robot. o Actions may be limited by the joints' operating range. After mounting the IR receiver on CM-530 under control mode, you can set the channels to control it remotely by pressing the Aux button. If you change the channel of the controller, you must also change the channel of RC-100. On how to change the channel of RC-100, please refer to Changing RC-100's Channel. If the robot does not receive commends for a period of time, it will standby in a seated position. My remote controller does not work properly. Check whether the IR receiver has been properly connected. Check whether the remote controller is on. Replace the battery and try again. Point towards the IR receiver and try again. Check if there are others controlling robots nearby, which may cause wireless interferences. We want to play soccer or battle with several robots. In order to play a game with several users, you must install the ZIG-110 set. ZIG-110 set is available at the Robotis shopping mall. 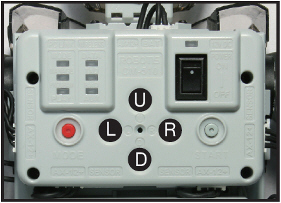 Please refer to "Controller" and "RC-100" for installation information. The robot will clap depending on how many times you clap. When DMS senor detects an object, the robot greets the user. If the robot does not sense any sound or object for a while, it performs various motions on its own. The robot will walk by itself while avoiding obstacles. When absolute distance sensor detects an obstacle, the robot will stop and turn left until the obstacle is no longer detected. If it falls down while walking, it will get back up in the direction it was moving. You may use the Check Assembly Mode to see whether your robot has been properly assembled. Isolate each motor and compare it to the standard posture. Start the Check Assembly Mode. It will release the torque. Check the ID of the motor with the LED and compare it with the ID in the Assembly Manual. ⇒ If the ID does not exist in the robot, a warning sound will be activated. Compare the position of the motors you have assembled to the basic posture. ⇒ If the LED is on but the torque is released, check the cables or the motor's assembly status.